All of you know very well that India sudar has implemented SEBLA- Science Experimental Based Learning and Awareness project in 68 Govt schools located in Karur and Thirupur Dt of TamilNadu in 2016-2017.This project is aimed at improving the science understanding skill of students studying in various Govt schools. Targeted Classes: 6th to 8th std. 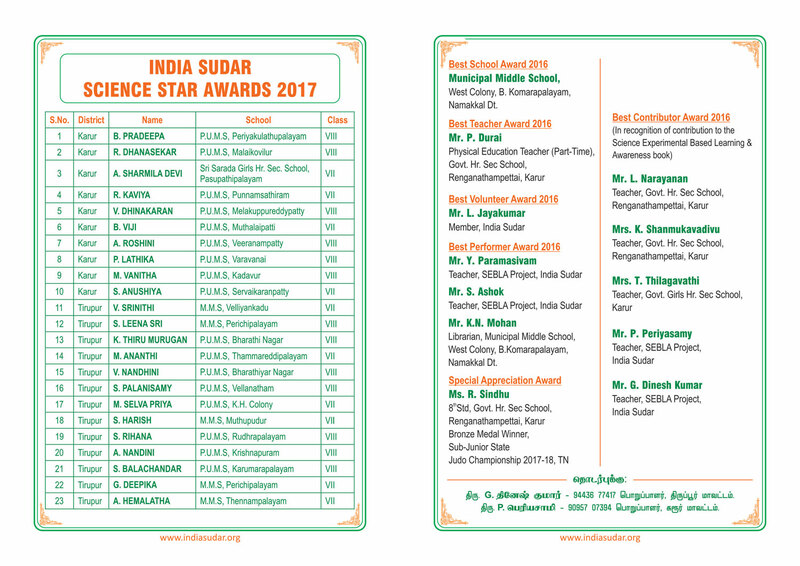 After assessing the skill (based on test , new models created by students), we are appreciating 23 students by honoring them with India Sudar Science Star Awards. The award ceremony is scheduled on 13 August 2017 @ Karur. On the same day, we are honoring Best school, Best teacher, Best Volunteers , performers and Contributors. We also planned to conduct few sessions to motivate students and parents. Mr V R Raghunathan , Chief R&D , Vaata Smart limited, Chennai will be sharing his experience on indigenous wind mill technology and production. Mr Manish Narnaware , IAS (Under Training) will be releasing the SEBLA book and motivate the students. 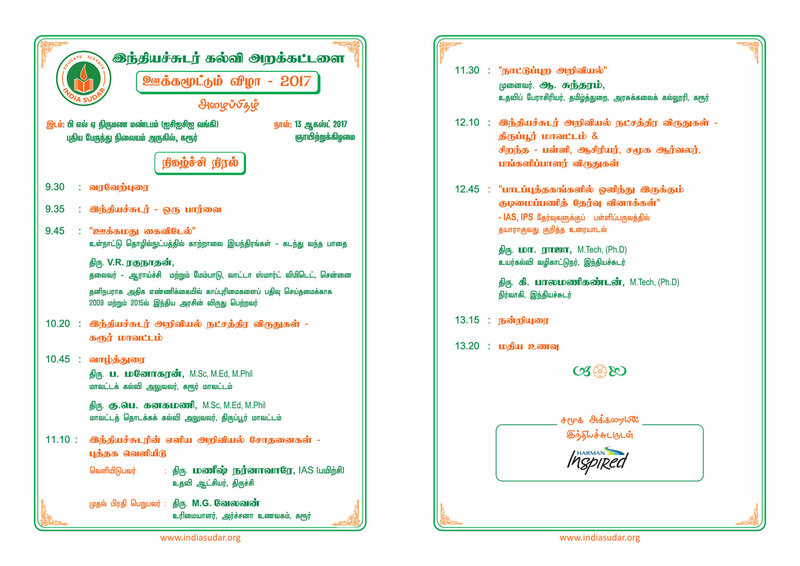 Dr Sundaram, Professor, govt Arts college, Karur will deliver a speech about " Science from village life". Our member Raja and myself will explain the preparation strategy for IAS and IPS exams during schooldays. Mr Velavan, owner of Archana Hotel has come forward and sponsored food and tea for this event. Our members are working behind this event . We welcome more volunteers to join us and make this event a memorable one. If anyone of you interested please come forward to donate/ sponsor prizes to the students. Invitation is attached herewith. All are Welcome. Last Saturday we visited JJ Public School near chanpatna. I went as a volunteer. This program was conducted by Disha Bharat NGO. It was full day program which was about value education to high school students and faculty development program for teachers. Program was very well structured and it was really great to be part. Please let me know if any one wanted to part of these programs, we can also along with Disha Bharat can participate the programs. IS-KA : GPUC MAJALATTI LIBRARY PERIODICALY REPORT. Please find attached status report for our Library deployment in Govt. PU College MAJALATTI, Chikodi Tq. Belagavi Dist. Karnataka State. Hope everybody is aware of our activity towards the school library improvement program. In this regard we continue to support the below mentioned schools in this educational year also, to subscribe the weekly/monthly magazines for their school libraries. It’s my pleasure to thank Mr. Balamanikandan and Mr. Muthukavin (rising the funds& take care of magazine subscriptions) , Mr. Jayakumar ( for designing the poster) and all our donors ( Mr .Sebastin Stephen, Mr. Rajesh Kanna, Ms. Sathya Priya, Mr. Manikandan, Mr.Sushil, Mr. Maheshwaran, Mr. saravanan) for their untiring efforts to implement this scheme as more effective and active one. Details regarding the magazine subscriptions are as listed below and kindly refer the attached reports for more details. Indiasudar has deployed teacher S.Geetha at one of our onsite school Panchayat Union Middle school, Kenganayakanpalayam, Tirupur Dt, to teach computer classes and video based learning for all the students. Indiasudar plans to conduct a mega event on 13th August 2017 @ Karur where SEBLA prize distribution to students (Karur and Thirupur Dt) , best school awards and best teachers award will take place. Approx. 250 students from remote villages will be attending. Motivational speech , interactions with experts will also be part of this event. I request all of you to block your dates and join the occasion and spend your valuable time with students. Agenda will be shared soon. We plan to provide simple lunch – variety rice. Cost: Rs 50 per plate. 250×50= 12500Rs. It will be great if you could donate complete / partially towards lunch expenses for 250 students.